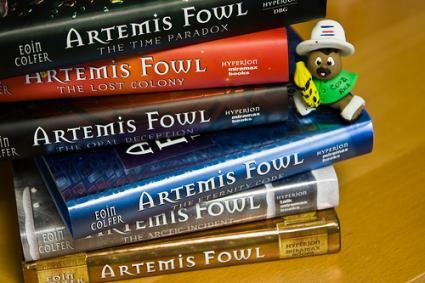 If you're a parent or relative of a kid who's nuts about Eoin Colfer's writing, reading through a quick Artemis Fowl summary can help you understand some of the hype behind the series. You may not be able to have in-depth discussions about the books with your child unless you read them yourself, but a summary will provide basic information about the characters and plot, and it's all you need to start asking questions and demonstrate a greater interest in the books. A basic Artemis Fowl summary of the first novel will familiarize you with the general premise and main characters of the series. For character summaries, see the section below. In book #1, Artemis decides to kidnap Captain Holly Short of the fairy Lower Elements Police Reconnaissance (LEPrecon) unit and hold her for a hefty ransom. He finds and subdues her with the help of his manservant, Butler, and returns Holly to his home. LEPrecon officers arrive to infiltrate Fowl Manor, but Artemis anticipates their plans and foils their operation with the help of Butler. Unsure what to do next, the LEPrecon crew recruits a notorious thief named Mulch Diggums to break in to Artemis's home. Ultimately, however, the fairies send Artemis the ransom he requested. Artemis agrees to let Holly go, but he asks her for a favor before he does. As fairies have special magic, Artemis wants Holly to use hers to cure his mother of her insanity. Holly bargains with Artemis and eventually grants his request at a price of half the gold ransom. At the end of the book, the LEPrecon officers attempt to kill Artemis and his associates with a powerful bomb, but Artemis manages to escape in time and take those he knows with him. Artemis Fowl: Artemis Fowl II is the series' antihero-an evil 12-year-old genius who intends to gather as much wealth and power as possible. Artemis has no problem with breaking the law and often does so in the course of carrying out his schemes, which are always carefully orchestrated. Artemis Fowl I: Artemis Fowl, Sr. is young Artemis' father, and the inspiration for his life of crime. He often travels on international missions and is gone for long periods of time. Artemis Jr. tracks down his father in the series' second book to find that his father has renounced the criminal lifestyle. Angeline Fowl: Angeline is Artemis's mother. When her husband went missing prior to the beginning of the series, Angeline went insane. At the beginning of the first book, she lives shut away in Fowl Manor. Butler: Butler is Artemis' manservant, bodyguard, and partner in crime. His family has served Artemis's family for many years, and Butler is very fond of Artemis. He is also one of the few people that Artemis trusts completely. Captain Holly Short: Holly is the first female captain of a LEPrecon unit. Her skills and intelligence are nearly unparalleled in the fairy world, and Artemis is immediately impressed with her fortitude. Throughout the series, the two are sometimes rivals but most often friends. Foaly: Foaly is a centaur and the LEPrecon's primary technical officer. He's a whiz with computers and is able to hack into even complicated systems with ease. Foaly is highly sarcastic and has questionable social skills. Commander Julius Root: Holly's immediate superior, Root has great power within the LEPrecon organization. He has a great respect for the hierarchy of the system and respect for Holly as well, although his temper sometimes gets the best of him when he discusses her actions. Root is eventually killed by a villain, Opal Koboi. Mulch Diggums: Mulch is a dwarf with little regard for the law. He's an infamous crook and has been stripped of his original magic, so he's become quite skilled at developing alternative ways to commit crimes and thievery. Minerva Paradiso: Minerva is a girl genius near Artemis's age. Her intelligence rivals his, and she originally attempts to outsmart him. Though an Artemis Fowl summary provides an adequate overview of the series, Colfer's witty and excellent writing make the books worth reading in full. If your child is interested in them, consider checking out the titles from the library together and discussing the characters and plot as you read.